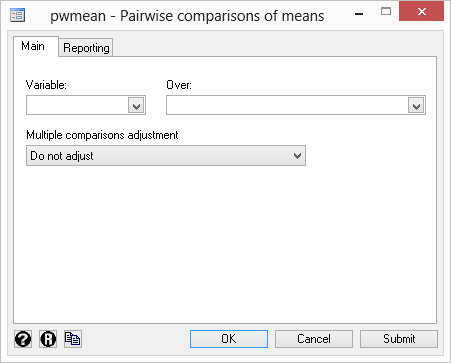 Pairwise comparisons were introduced in Stata 12. See the latest version of pairwise comparisons. See all of Stata's pairwise comparisons features. Stata 12 has two new commands for performing all pairwise comparisons of means and other margins across the levels of categorical variables. The pwmean command provides a simple syntax for computing all pairwise comparisons of means. After fitting a model with almost any estimation command, the pwcompare command can perform pairwise comparisons of estimated marginal means and other types of marginal linear predictions. In addition, the margins command now allows for performing all pairwise comparisons of linear and nonlinear predictions, such as marginal probabilities. With each of these commands, p-values and confidence intervals can be adjusted for multiple comparisons. If treatment=1 is a control and the other levels represent treatments, we may want to use Dunnett’s method for making comparisons. and obtain pairwise comparisons of all the cell means for the interaction. Note: Margins sharing a letter in the group label are not significantly different at the 5% level. Because there are many pairwise comparisons, we obtain the results of the tests symbolically. Two means that have the same letter are not significantly different from each other at a 5% significance level.